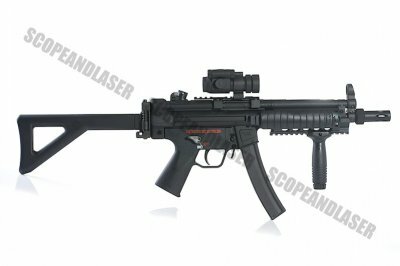 The most tactical of the NP5 series, the RAS version comes with a 3 sided RIS rail on the entire fore-grip for attachment of any accessory you desire. Rail covers included for left and right rails for when protection when they are not in use. Vertical fore-grip is included with the gun. PDW style folding stock means that the RAS can be made very compact for CQB skirmishes - the folding stock hinge is strengthened to ensure even greater durability than the standard PDW. PDW style detachable flash suppressor comes off in a snap from the metal 3 lug counter-clockwise threaded barrel tip that allows easy installation of a wide range of silencers. 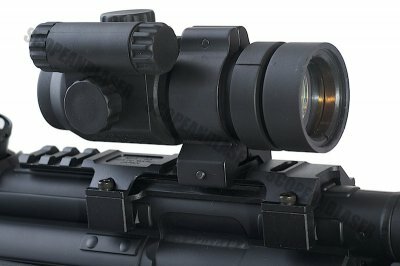 A newly designed detachable low mount base, singular Pro-Sight II Aluminum mount ring, along with a crystal clear three level Pro-Sight II red-dot scope is included with this gun. 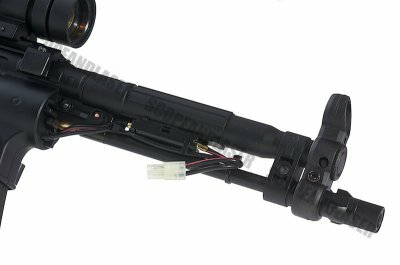 Metal parts include front sight and sling mount, RIS rail system, cocking lever, scope mount, scope ring, scope, rear adjustable sights, magazine, magazine release switch, trigger, folding stock hinge and rear sling mount. Small battery is stored internally within the RIS foregrip. 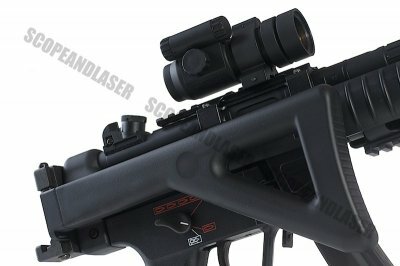 A must have for CQB lovers. 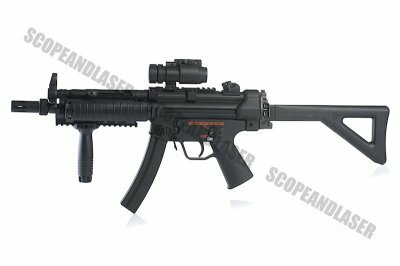 After being out of stock for 2 years, Tokyo Marui is delivering their first renewed batch to RedWolf in January 2006! Order now to secure yourself one from this limited initial batch. It's uncertain how many Marui will manufacture in this run, and when they will manufacture this model again! The threaded barrel allows installation of a counter-clockwise threaded silencer which you can find in our silencers section. For those wishing for a larger capacity battery, consider getting a Fixed stock conversion. Also, considering opting for a 200 round high capacity magazine and a sling.